Heterozygous germline TP53 gene mutations result in Li-Fraumeni Syndrome (LFS). Breast cancer (BC) is the most frequent tumor in young women with LFS. An important issue related to BC in the Mexican population is the average age at diagnosis, which is approximately 11 years younger than that of patients in the United States (U.S.) and Europe. The aim of this study was to determine the prevalence of germline mutations in TP53 among young Mexican BC patients. We searched for germline mutations in the TP53 gene using targeted next-generation sequencing (NGS) in 78 BC patients younger than 45 years old (yo) who tested negative for BRCA1/2 mutations. A group of 509 Mexican women aged 45yo or older without personal or family BC history (parents/grandparents) was used as a control. We identified five patients with pathogenic variants in the TP53 gene, equivalent to 6.4% (5/78). Among patients diagnosed at age 36 or younger, 9.4% (5/55) had pathogenic TP53 mutations. Three of these variants were missense mutations (c.844C > T, c.517G > A, and c.604C > T), and the other two mutations were frameshifts (c.291delC and c.273dupC) and had not been reported previously. We also identified a variant of uncertain clinical significance (VUS), c.672G > A, which causes a putative splice donor site mutation. All patients with TP53 mutations had high-grade and HER2-positive tumors. None of the 509 patients in the healthy control group had mutations in TP53. Among Mexican BC patients diagnosed at a young age, we identified a high proportion with germline mutations in the TP53 gene. 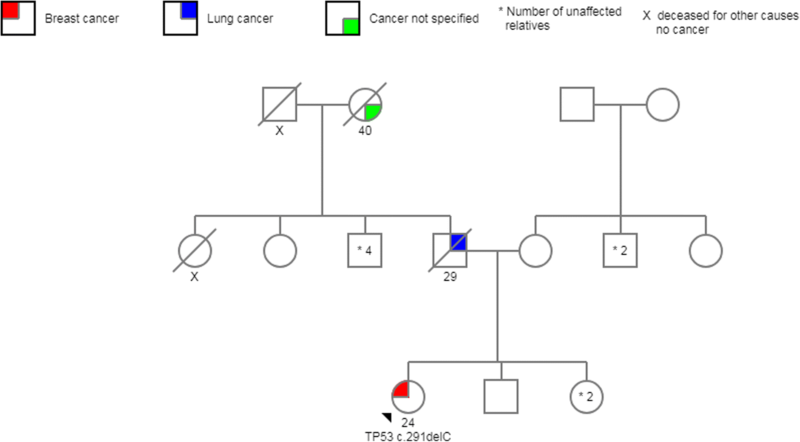 All patients with the TP53 mutations had a family history suggestive of LFS. To establish the clinical significance of the VUS found, additional studies are needed. Pathogenic variants of TP53 may explain a substantial fraction of BC in young women in the Mexican population. Importantly, none of these mutations or other pathological variants in TP53 were found in the healthy control group. Breast cancer (BC) is the leading cancer-related cause of death in women between the ages of 20 and 59 years . The general population has an 8 to 12% lifetime risk of developing BC [2, 3]. This percentage significantly increases when there is family cancer history associated with a hereditary cancer predisposition syndrome [4–10]. With the use of next-generation sequencing (NGS), many genes (> 60) associated with the risk of hereditary cancer have been identified [4, 11–14]. 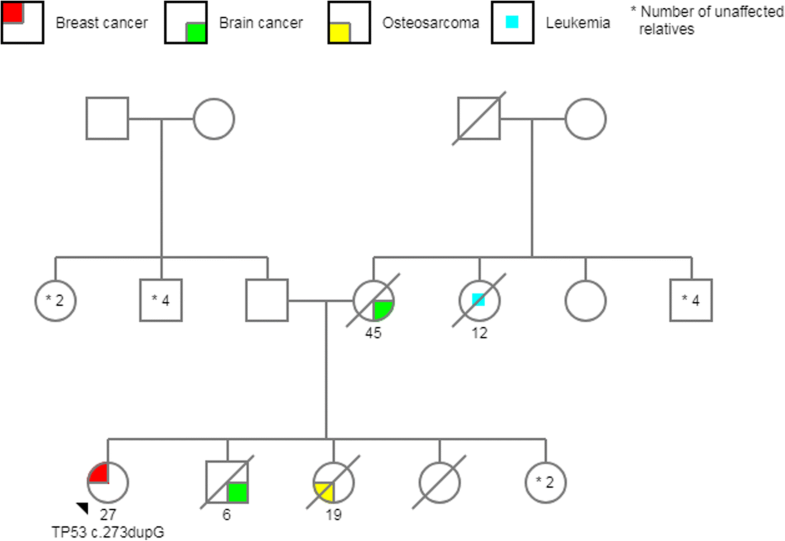 Germline TP53 mutations cause Li-Fraumeni Syndrome (LFS) (Online Mendelian Inheritance in Man [OMIM] #151623) ; patients with this syndrome show a predisposition for a broad spectrum of tumors, including adrenocortical carcinoma, bone and soft-tissue sarcomas, brain tumors, and early-onset BC . The lifetime risk of developing cancer in patients with LFS is > 90% by the age of 60. This percentage differs depending on gender, at approximately 68% in males and 93% in females. This difference is due to the high rate of women with LFS who develop BC at an early age (pre-menopause), making BC the most common cancer in LFS carriers (24–31%) [3, 16–20]. The most commonly used criteria to facilitate the diagnosis of LFS are those characterized by Chompret et al., 2001. Recently, other researchers have revised these criteria by adding other factors that include more individuals at risk of having TP53 mutations. The TP53 gene, located at chromosome 17p13.1, is a tumor suppressor gene that is 20 kilobases (kb) long and contains 11 exons. It encodes the transcription factor P53, which plays major roles in both cell growth regulation and maintenance of cellular homeostasis. In response to cellular stress, the p53 protein regulates target gene expression to induce cell cycle arrest, apoptosis, senescence, DNA repair, or changes in metabolism. The activity of p53 is ubiquitously lost in human cancers either by mutation of the TP53 gene itself or by the loss of cell signaling upstream or downstream of p53 [21, 22]. Among the high-penetrance genes associated with inherited BC syndromes, mutations in BRCA1 and BRCA2 are the most prevalent and have been found in 20–40% of hereditary BC cases . Recent studies have suggested that mutations in TP53 are responsible for 1% of BCs and between 15 and 20% of all hereditary cancers [3, 17, 23, 24]. TP53 gene mutations are present in 2–6% of BC patients younger than 35 [25–28]. Other genes related to BC risk are PTEN, TP53, CHEK2, ATM, STK11/LKB1, CDH1, RAD50, PALB2 and others [24, 29]. Mexico has a complex population structure including indigenous populations, European (especially Spanish) populations and African immigrants. The percentages vary widely across the country . At present, the majority of the Mexican population is mestizo with similar proportions of European and Native American ancestries, with up to 5% black ancestry in individuals living on the coasts . The average age of BC diagnosis in the Mexican population is approximately 11 years younger than in other populations (particularly those of the U.S. and Europe) (50 years old in Mexico vs. 61 years old in the U.S. and Europe) [32, 33]. A study performed in the U.S. indicates that the differences in age at presentation of BC can be accounted for by the ancestry of the population: 47% of Hispano-American patients had BC before the age of 50, while only 25% of Caucasian patients had BC before that age. This observation is highly relevant to the search for germline mutations in cancer-predisposing genes in women with BC in Mexico because, as mentioned previously, the principal characteristic of cancer-predisposing syndromes is the early age of onset . In Mexican women with BC, the prevalence of BRCA1/2 mutations is approximately 15%. The Mexican founder mutation (BRCA1 ex9-12del) accounts for 30% of BRCA-associated BC. Despite the high prevalence of mutations in BRCA 1/2 genes, a large proportion of the young population with BC does not have variations in those genes [34, 35]. The objective of this study was to determine the prevalence of germline mutations in the TP53 gene among Mexican women with early-onset BC. We performed a descriptive study in young women with BC who were diagnosed and treated at the Instituto Nacional de Cancerología (INCan) in México City from December 2013 to October 2015. The Institutional Ethics Committee approved the study. After obtaining a signed informed consent, we did an interview to obtain personal and family history. Tumor data were extracted from the pathology reports in the patients’ clinical file, and DNA was obtained from blood lymphocytes. In a cohort of patients at high risk for hereditary BC, there were 394 women younger than 45 years old. From this group, 65 were identified as BRCA (+), 32 had BRCA VUS, and 279 were negative for the BRCA mutation. From the group of BRCA-negative patients, the first 78 consecutive patients were selected for this evaluation. A group of 509 Mexican women aged 45 years or older without personal or family BC history (parents/grandparents) was used as a control. This group is part of a Mexican-mestizo population-based cohort, for whom whole-exome sequence data were available (SIGMA Type 2 Diabetes Consortium, 2014). Two hundred nanograms of each genomic DNA sample was divided into eight different restriction reactions. 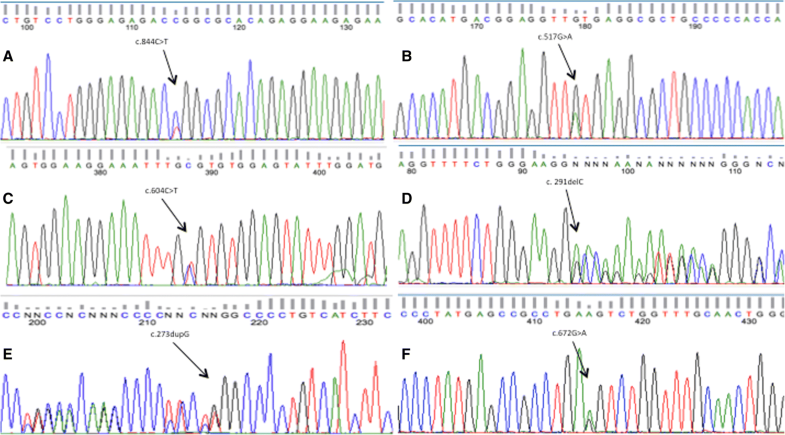 After digestions were completed, the fragmented gDNAs were hybridized to custom-design biotinylated HaloPlex probes directed to the complete genomic regions of BRCA1, BRCA2, and TP53. This resulted in a total of 253,521 nt of targeted DNA in the presence of a unique 8-bp index primer cassette, which allowed the multiplexing of samples. Hybridization resulted in circularization of gDNA fragments and incorporation of the indexes and Illumina sequencing motifs. DNA probe biotinylation allowed the capture of target DNA hybrids using streptavidin-coated magnetic beads. After ligation, the eluted targeted fragments were amplified by PCR (18–19 cycles) to produce a target-enriched sample. Libraries were purified using AMPure XP beads (Beckman Coulter, CA). Enrichment of each library was validated using the 2100 Bioanalyzer (Agilent Technologies) and Qubit quantification. 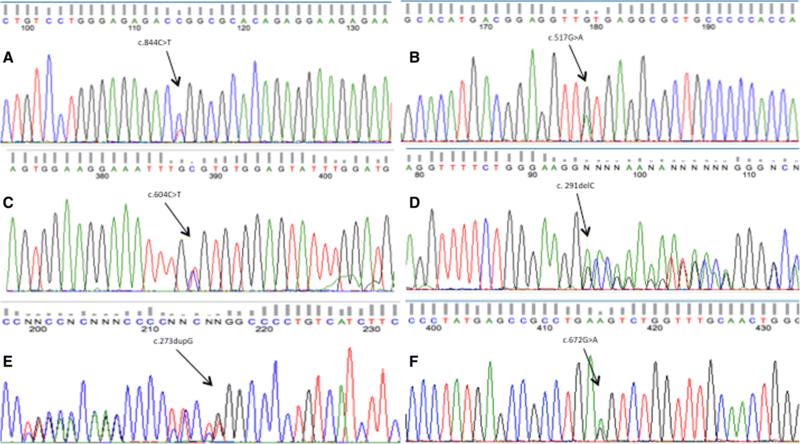 DNA sequencing was performed on a HiSeq2500 sequencing system (Illumina, Inc., San Diego, CA) with 2 x 150pb paired-end reads using v3 reagents following the manufacturer’s instructions. The average fraction of on-target reads was 0.38. The minimum average range suitable for the panel was established at 2000x. Up to 20 samples were multiplexed in one lane (average of 3500x coverage after removal of duplicate reads). Our platform detected single nucleotide variants (SNV), insertions/deletions (indels), copy number variants (CNVs) and gene rearrangements, including a BRCA1 del [9–12] mutation described as a founder mutation in BC Mexican patients . All mutations were validated by PCR amplification and Sanger sequencing. Patients received genetic counseling before and after the test. Pipeline data analysis was performed as described by Cabanillas et al., 2017 . Briefly, FASTQ files were evaluated using quality checks from Fast QC (http://www.bioinformatics.babraham.ac.uk/projects/fastqc/). Trimmomatic was used to find and remove low-quality bases and contaminants of adapters and sequencing indexes . Each library was then aligned to the human genome data (hg19 / GRCh37) as the reference. Processing and alignment were carried out through the BWA program and SAMtools (http://sourceforge.net/projects/samtools/files), respectively . Germline mutations were identified using VarScan2 tools (http://sourceforge.net/projects/varscan). Identified variants were annotated using several databases including Ensembl, CCDS, RefSeq, Pfam, dbSNP, 1000 Genomes, COSMIC, ICGC and HGMD and by using different scoring algorithms for functional prediction such as SIFT, Polyphen, Mutation Assessor, Mutation Taster, FATHMM, and FATHMM-MKL. In addition, allelic frequencies of the identified TP53 mutations were analyzed in a control group of 509 Mexican women aged 45 years or older than without personal or family BC history, for whom whole-exome sequence data were available . Five pathogenic TP53 variants were identified according to the variant classification criteria described by Cabanillas et al., 2017 . The overall prevalence of these variants was 6.4% (5/78), a percentage that rises to 9.4% if we consider only patients who were diagnosed before the age of 36 (5/53). In addition, we identified a VUS, c.672G > A, that caused a silent mutation in a splice donor site in a patient who met the Chompret criteria for LFS (Fig. 1). None of the 509 patients in the healthy control group had mutations in TP53. These mutations were identified from a group of 78 patients with early-onset BC who were found to be negative for mutations in BRCA1 and BRCA2 through HISPANEL mutation screening . The median age at diagnosis was 32 years, > 50% (n = 41) presented with locally advanced stages or with metastatic disease, and the prevalent histologic types included invasive ductal and lobular carcinomas (CCI and CLI) (Table 1). We obtained a complete pedigree from all patients; 63 had BC and familial history of neoplasia in first-, second- and third-degree relatives, and 15 patients diagnosed with invasive breast cancer under the age of 45 years had no reported family history of cancer. All the Li-Fraumeni patients had a family history consistent with a high risk of hereditary predisposition to cancer syndrome, and among non-carrier patients, nearly 80% had a family history of cancer. From TP53-negative patients with a positive family history of cancer, 19% had a first-degree relative affected by cancer, and the other 81% had at least one family member diagnosed with cancer before age 45 or two or more relatives with cancer at any age. Minimal and maximal coverage for the mutations detected in TP53 were 843X and 2780X, respectively. Three of the pathogenic variants identified were missense mutations and had been reported to the International Agency for Research on Cancer (IARC) TP53 database: c.844C > T; c.517G > A, and c.604C > T. The other two variants were frameshift mutations (c.291delC and c.273dupC) and had not been reported previously; however, they are likely to be pathogenic according to the biological consequence of this type of mutation (Fig. 2) (Table 2). All of these five mutations were found in BC women younger than 36 years old, and family history are shown in Figs. 3, 4, 5, 6 and 7. The last variant, c.672G > A, was classified as a VUS. It is found at a splice donor site and has a potential consequence for splicing (Figs. 1 and 2). None of these mutations were found among the 509 Mexican women aged 45 years or older without a personal or family BC history. 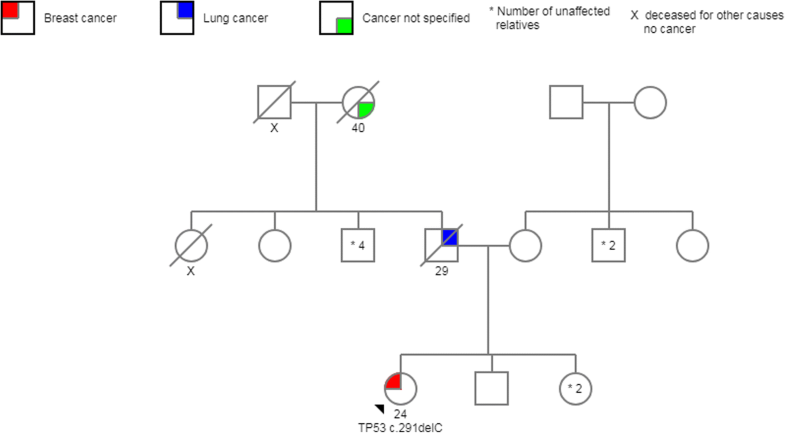 All patients identified as having pathogenic variants in TP53 had a familial history suggestive of LFS. The youngest age at diagnosis was 24, and the oldest age was 36. The clinical descriptions of the tumors are detailed in Table 3. The pedigrees of the mutation-positive probands show 16 cancer-affected first-, second-, and third-degree relatives. The most frequent tumor was lung cancer, followed by leukemia and colon cancer (Table 4). The HER2-positive patient with the VUS was 44 years old and pre-menopausal at the time of diagnosis with invasive ductal carcinoma (Fig. 2). The identification of hereditary syndromes that predispose carriers to develop early-onset BC is essential to consider in our population. In Mexican women with BC, the prevalence of BRCA1/2 is approximately 15%. The Mexican founder mutation (BRCA1 ex9-12del) accounts for 30% of BRCA-associated BC . Despite the high prevalence of mutations in BRCA1/2 genes, a large proportion of the young population with BC did not present with pathogenic variants in these genes. The younger average age of diagnosis with BC in Mexican women might be explained in part by the age distribution of the population , but we must also consider hereditary syndromes that predispose carriers to develop early-onset BC other than BRCA1/2 as another explanation for the young mean age of BC-onset in Mexico. We found a high rate of mutations in TP53 in women younger than 36 years old. The frequency in the present study is the second highest reported in the literature after that reported in Southern Brazil, where the founder mutation TP53 (R337H) is known to be present in 12% of young women with BC [28, 40–46]. The first mutation identified, c.844C > T p.R282W, was initially reported as a founder mutation in the French-Canadian population . The IARC database describes this mutation in 39 families [19, 46–48]. Our patient identified herself as a mestizo Mexicano, she and her family are from the center area of the country  (Fig. 3). In the IARC database, the c.517G > A pathogenic variant is recorded in two Brazilian families and the other missense mutation c. 604C > T was registered only in Germany population . Both of our patients denied that their ancestors come from another country. The last two mutations have not been described in the literature. Frameshift mutations account for 11% of all mutations found in the TP53 database, and immunohistochemical analyses show a complete absence of TP53 protein expression  (Figs. 6 and 7). Finally, a mutation classified as a VUS, localized at the end of exon 5 and likely to be impair TP53 splicing, was found in a BC patient with a family history that meets the Chompret criteria  (Fig. 1). It is now well established that this kind of mutation can have critical effects on RNA splicing, stability, and translation efficiency . Two patients with LFS had an invasive lobular carcinoma, a histopathological type not previously reported in other series assessing the histological features of breast neoplasms in patients with this syndrome. All HER2-positive patients had characteristics that have been widely described in the literature [20, 45, 46, 50]. Different studies have reported TP53 mutation frequencies from 3 to 8% in patients with BC aged younger than 30 years or in patients aged 30–39 with BC with family histories of LFS-associated cancers [28, 40, 41]. De novo TP53 mutations have been reported in 7 to 20% of BC cases [42, 51]. 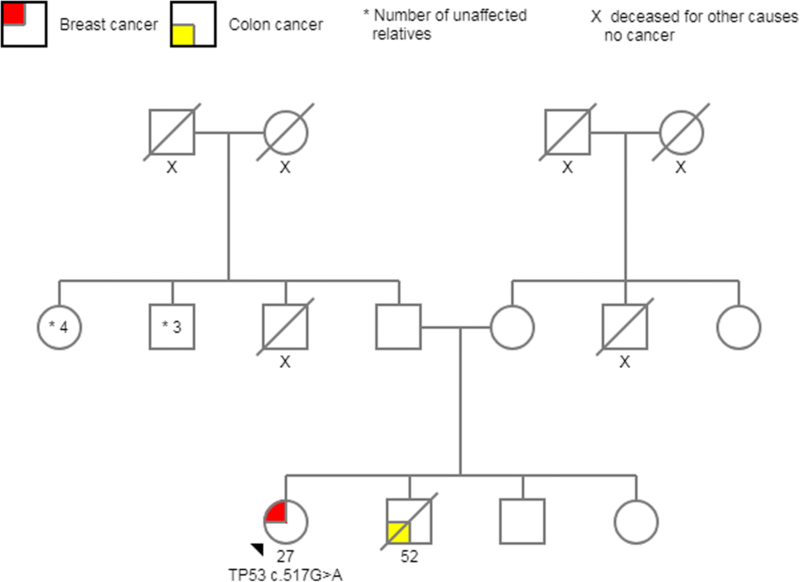 It is rare to find TP53 mutations in patients with BC older than 50 [11, 24, 52]. 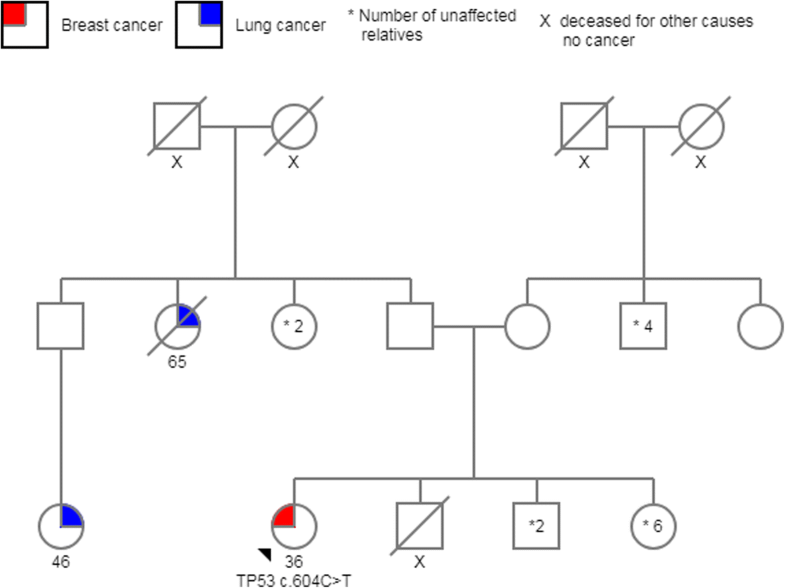 Lung cancer was the most frequently reported tumor in the family members of our patients with TP53 gene mutations; until the 2009 proposal of the Chompret criteria, lung cancer was included among the tumors related to LFS . Germline mutations in the TP53 gene may explain a substantial percentage of BC in young Mexican women. In routine clinical practice, it is essential to recognize the relevance of familial history in identifying this group of high-risk patients. All patients in whom pathogenic variants were detected had a family history suggestive of a hereditary predisposition to cancer [10, 20, 53–57]. Incomplete penetrance is a crucial factor to consider in the assessment of LFS, even more so if the family history of malignancy comes from the paternal side. The Mexican National Guidelines of Breast Cancer recommends offering molecular tests for the suspected gene/syndrome in women with BC and at high risk for hereditary cancer predisposition. Regarding multigene panels for hereditary cancer, the guidelines suggest that they should be ordered only by a geneticist with experience in hereditary cancer risk assessment who recognizes the limitations of the panels, due to the lack of clinical guidelines and a high percentage of variants of uncertain clinical significance that can be obtained by performing these studies. Our project is one of the first that involves the analysis of genes predisposing women to BC other than BRCA, which is information that will help us in the clinical context of timely detection, prevention, and even risk modification. Importantly, none of these mutations or other pathological variants in TP53 were found in the healthy control group. Knowledge about the prevalence of germline TP53 mutations in young women with BC in the Mexican population will facilitate the implementation of specialized clinical programs, which will directly impact the prognosis of this particular group of patients and their families. The importance of distinguishing between an isolated tumor not related to germline mutations and cancer predisposition syndromes lies in the impact that this exerts on the family, at the economic and social levels for the health system (it is less costly to treat early-stage cancer), and at the social level, avoiding death of young patients who frequently have small children. 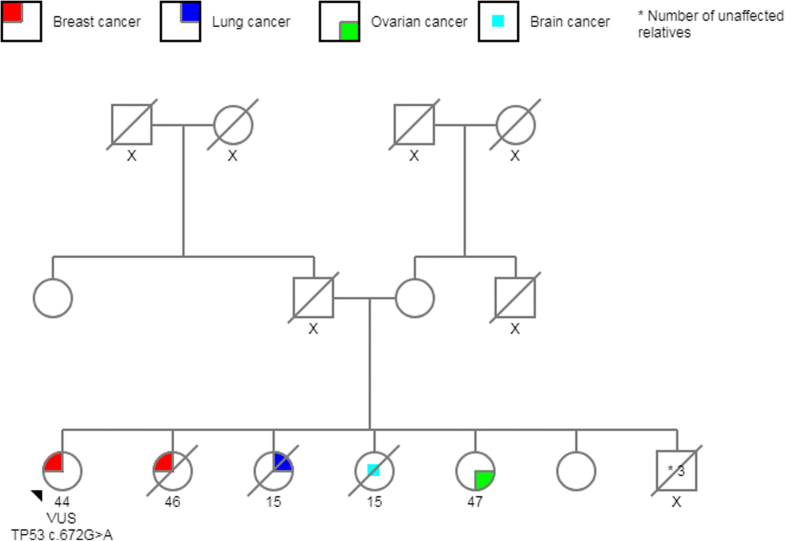 The identification of a mutation in a family makes it feasible to analyze at-risk relatives, potentially allowing early detection and prevention in carriers [58, 59]. One limitation of our study is the possible recruitment bias because our sample was obtained by convenience from a large cancer risk predisposition cohort. An increase in the sample size could yield a more accurate estimation of the prevalence of mutations in TP53, as well as the identification of other novel putative mutations among this group of patients. Lenny N. Gallardo-Alvarado and María Teresa Tusié-Luna contributed equally to this work. This work was carried out at the Instituto Nacional de Cancerología (INCan)/National Institute of Cancerology and at the Unidad de Biología Molecular y Medicina Genómica (UBMMG) (Molecular Biology and Genomic Medicine Unit) of the Instituto Nacional de Ciencias Médicas y Nutrición Salvador Zubirán/Biomédicas (INCMNSZ) (National Institute of Medical Sciences and Nutrition Salvador Zubirán, Universidad Nacional al Autónoma de México (UNAM), National Autonomous University of Mexico). We thank Saul Cano-Colín for technical assistance. Funding was provided by the DGAPA-UNAM project IT-201614 from the Universidad Nacional Autónoma de México for the collection of samples and material needed to do the NGS. At the present time, they only accept data that have been accepted for publication in peer-reviewed journals. We submit this data immediately that our work has been published. Each of the authors listed had a relevant role in the process of the work and manuscript, in either the clinical area, molecular testing, molecular data analysis, general data analysis and/or review of the final version of the document. All authors of the manuscript have read and agreed to its content and are accountable for all aspects of the accuracy and integrity of the manuscript in accordance with ICMJE criteria. LNGA: Conception and design, informed consent process, pre-test genetic counseling, acquisition of data, analysis, and interpretation of data, drafting the manuscript. MTTL: Design of the trial, molecular testing, bioinformatics molecular analysis, interpretation of the results and drafting of the manuscript. MITL: bioinformatics molecular analysis, interpretation of the results. JDC: Acquisition of data, bioinformatics molecular analysis, interpretation of the results. YXS: bioinformatics molecular analysis, interpretation of the results. EBR: Informed consent process, interpretation of the results, drafting the manuscript and critical review. CVG: Informed consent process, interpretation of the results, drafting the manuscript and critical evaluation of the manuscript. LAHM: Interpretation of the results, drafting the manuscript and critical review. EMHM: bioinformatics molecular analysis, interpretation of the results. DFCL: Conception and design, acquisition of data, analysis, and interpretation of data, drafting and final review of the manuscript. This work has been performed in accordance with the Declaration of Helsinki, with the approval of our local IRB (Comité de Etica en Investigación del Instituto Nacional de Cancerología) local approval number 012/052/OMI-CB 805/12. The informed consent was obtained in written format, signed by the patient, two impartial witnesses and the principal investigator. Further information and documentation to support this is available to the Editor on request.